We have been pretty busy lately. The new school year is finally underway here. Unfortunately, the Gurukula is not quite as organized as most schools, though things are looking somewhat optimistic here at the beginning of the semester. We have taken on six new students, two from Holland, two from Uttar Khand, one from Manipur and one from Karnatak. Several of the deadwood students have been trimmed away. But the faculty staff problem is still acute. We are expecting a retired ESL teacher from Cornwall to come in two weeks time, but until then I am going to be taking both English and Sanskrit classes. This really works out to more than two classes, because there are different subgroups in both. It is a bit like the old one-room schoolhouses that they had out on the frontier, with everyone from the small kids to the high school students in one room. That makes organization difficult. Luckily we have Chandramaniji to teach advanced Sanskrit, so that rounds out one aspect of the syllabus nicely. Last night I also gave a lecture on "the philosophy of Hatha Yoga." There was a good audience, since there is a group doing teacher's training from Holland, U.S. and China. There was also a sizable group from the western U.S.A., brought here by Sherri Baptiste Freeman and India Supera. 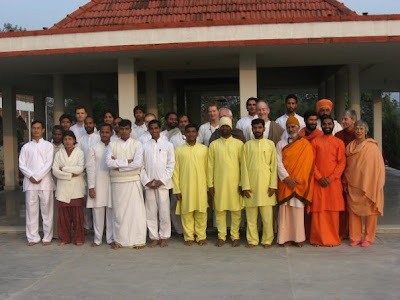 When there are many international students like that, the ashram is pretty lively. There must have been at least 75 people in the meditation hall this morning. Swami Veda came back a few days ago. He was very tired, so I did not go to see him, but he invited me upstairs for dinner the day before yesterday, and I invited myself up yesterday after the Philosophy of Hatha Yoga lecture, which is based on one of his books. He was looking much better. He's doing pretty well for a man of 75, with all his traveling around the world and lecturing. I am still giving other classes as well at Madhuban and Vrindavan Ashram. And besides that I am trying to work on this Bhagavat-sandarbha project. The big time loser is reading Internet sites related to the current American presidential election. It is something of an indulgence. It seems that there are always anarthas around to be trimmed.